Find a therapist in Ohio with GoodTherapy.org. More than 11.6 million people lived in Ohio in 2015. Elderly residents (age 65 and older) made up 15.9% of the population, while minors made up 22.6%. Census data also indicates 82.7% of the population is white, 12.7% is black, and 2.1% is Asian. Approximately 51% of the population is female. About 74,900 residents worked social service, health care, and community assistance jobs in 2015. Jobs within this group included working as a psychiatrist, child psychologist, parole officer, counselor at a residential treatment center, counselor at a drug and alcohol rehab center, community health worker, health educator, guidance counselor, therapist at a depression treatment center, clinical social worker, or a marriage and family therapist. In Ohio, residents employed in these and other related occupations earned a mean annual wage of $43,950. Mental Health America (MHA) conducts an annual survey on mental health standards in the United States. In the 2016 survey, the state of Ohio received an overall mental health rank of 24th. In addition to the overall rank, the state was also evaluated in specific mental health categories. Ohio was 26th in adult ranking, 18th in youth ranking, 22nd in prevalence of mental health and substance dependence issues, and 29th in access to professional mental health care. Most of these rankings are mid-range, meaning the state sees average rates of mental health issues and access to treatment. The 2016 MHA survey reports 19.7% of residents older than 18 are experiencing mental health issues. This percentage is equivalent to roughly 1.7 million people. Data from the Substance Abuse and Mental Health Services Administration (SAMHSA) states 7.7% of adults age 21 or older engaged in heavy alcohol use in Ohio between 2009 and 2013. This figure is higher than the national average of 6.8% over the same period of time. According to the 2016 MHA survey, Ohio was 23rd for adult dependence or misuse of alcohol or illicit drugs, with 8.7% of the adult population affected. The survey also claims 344,000 adults in the state experience serious thoughts of suicide. In 2016, roughly 301,000 adult residents with mental health issues have no insurance. 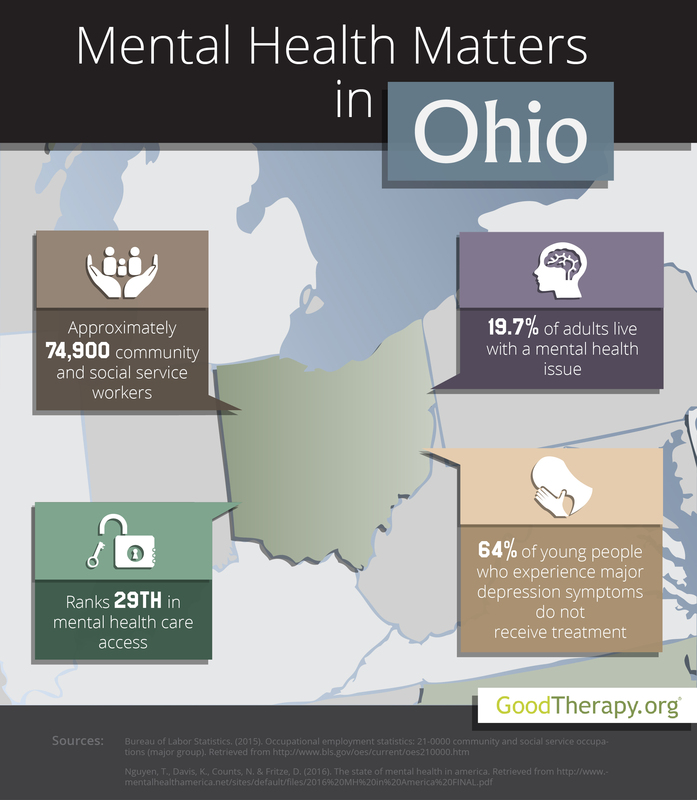 Approximately 329,000 residents who tried to find a therapist in Ohio experienced socioeconomic barriers to treatment. Depression among younger residents is a major concern for some child psychologists in Ohio. Mental Health America reports 59,000 young people in the state are currently experiencing severe major depressive episodes. Of this population, only 10,000 children receive consistent depression treatment. At present, the state is ranked 39th in mental health workforce availability—with 716 residents to each mental health provider in the state.